THERE IS NO GOD BUT GOD AND SKASKASH IS ITS PROPHET! Alexis Gilliland is a four time Hugo winner—but not for his written fiction. Only his 1982 John W. Campbell Award for Best New Writer was for fiction; his fellow nominees were Robert Stallman, Paul O. Williams, David Brin, and Michael Swanwick 1. You may have heard of some of these guys. When he won, Gilliland had just two novels in print 2. Partly it’s because most Campbell nominees tend to have only small bodies of work when they win, due to the whole New Writer thing. Cynics might say that Gilliland’s long career as fan and lauded fan artist ensured name recognition. 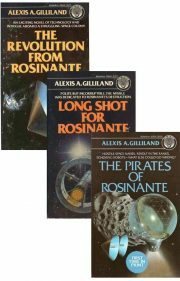 But I would credit his Campbell win to the fact that those two novels, The Revolution from Rosinante and Long Shot For Rosinante , really are fun little books, books I was certain I would not regret revisiting after a gap of twenty-two years 3. They are also the first two volumes in the Rosinante Trilogy, the subject of today’s review.